To offer guidance and support to the parents of LGBT Asian American, South Asian, Southeast Asian, and Pacific Islander (API) children, The National Queer Asian Pacific Islander Alliance (NQAPIA) continues its Asian Family Acceptance Workshop Tour, launched this past May. These unique workshops are taking place in major American cities throughout the year. The Boston workshop, locally hosted by The Queer Asian Pacific-Islander Alliance (QAPA), the Massachusetts Area South Asian Lambda Association (MASALA), and The Asian American Resource Workshop (AARW), will be presented in Jamaica Plain on Saturday, September 24, from 12:00 Noon to 3:00 pm at Old Oak Dojo, located at 14 Chestnut Place, Jamaica Plain, MA 02130. To RSVP in advance, visit bit.ly/rsvpfamilyacceptanceand select “Boston” in the drop-down menu. Clara Yoon: Proud Korean mother of a transgender, bisexual son, living in New York City. She is the founder of API Project of PFLAG NYC that provides support for LGBTQ individuals and families of Asian heritage and addresses culture-specific needs of the API community. She also serves on the board of PFLAG NYC chapter. Clara is passionate about supporting and advocating for LGBTQ youths specifically to prevent bullying, suicide and homelessness. She also believes in the importance of improving LGBTQ equality in homelands and faith groups to create better acceptance to LGBTQ individuals within the API communities. Aya Yabe: A mother of a married gay daughter, Aya is a member of PFLAG NYC API Rainbow Parents (ARP) and is involved with community outreach efforts. 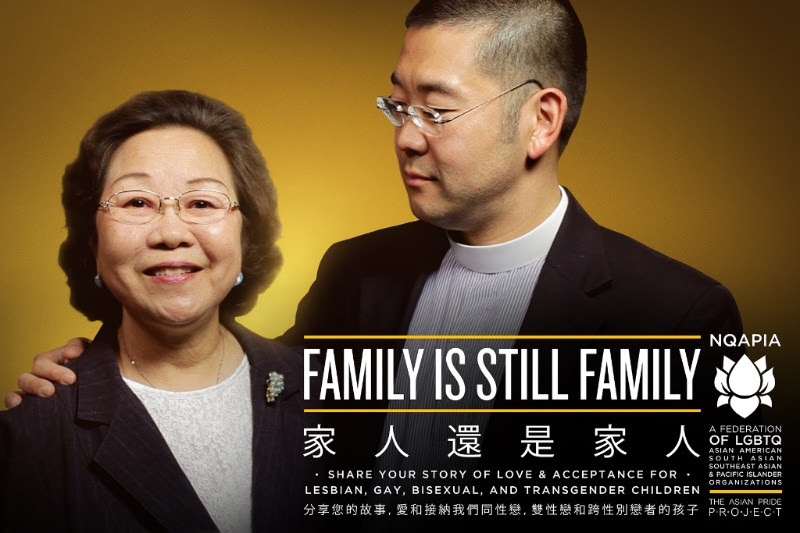 She is pledged to increasing the visibility of Asian parents of LGBTQ+ children in society. She is originally from Japan, where she has strong ties with the country’s LGBTQ community. In New York City, Aya volunteers as a Japanese language interpreter-translator for NPOs/students who visit from Japan to learn about LGBTQ activism. With Clara Yoon, the founder of ARP, Aya was invited to sit on a panel for a discussion on coming out, organized by Nijiiro Diversity, one of the prominent Japanese LGBT NPOs during 2016 Tokyo Rainbow Pride Week. Tejan Oza: The mother of a queer daughter named Tina, Tejan has navigated a long journey to embrace her child, due to internalized pressures and beliefs originating from certain Indian communities. After attending NQAPIA’s parent institute in Chicago, Tejan has committed to becoming her daughter’s greatest ally. Tejan lives in North Andover, MA, and works as an accountant at AT&T. Tina is currently studying at UPenn for her Masters in Nursing with midwifery. Tejan’s son Jay is a teacher in Lawrence, MA. Neelam Jethwani: The mother of a married gay son, Neelam began her journey of acceptance while still living in India. She is passionate about human rights and fairness and actively works for the rights of female domestic workers in India through her non-profit organization. Despite her work, Neelam was only able to find love for her son and son-in-law after going through a unique journey that was not just personal, but also societal and legal, in a country that still criminalizes homosexual acts. The Boston workshop will be moderated by Glenn Magpantay, Executive Director of NQAPIA. It will offer culturally appropriate peer-support and practical steps to empower API parents to support their LGBT children in the coming-out process. The workshop will be offered in English. 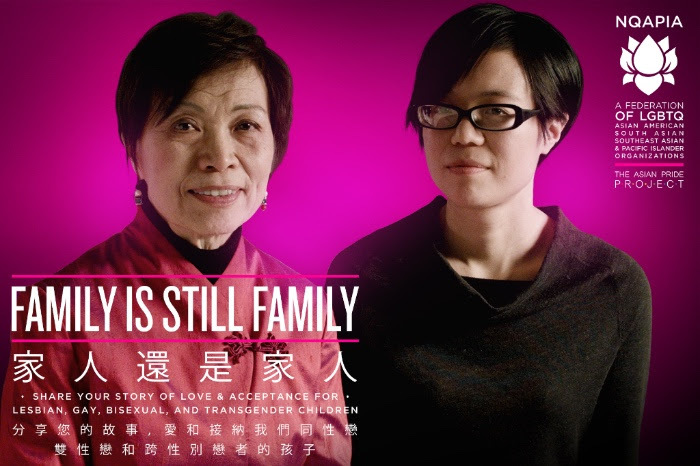 The parents appearing at the workshops are involved in NQAPIA’s landmark Asian Family Acceptance Campaign, a series of emotionally-moving TV ads entitled “Family Is Still Family.” The ads ran throughout the month of June nationally. Additional workshops will be held through the end of 2016. The Queer Asian Pacific-Islander Alliance (QAPA) is the oldest Asian queer organization in the United States. QAPA is committed to providing a supportive social, political, and educational environment for LGBTQ AAPIs in the Boston and New England area. Massachusetts Area South Asian Lambda Association (MASALA) is a volunteer-led community organization focused on supporting and engaging the South Asian queer community on a broad range of topics through events and community forums. The Asian American Resource Workshop (AARW) is an intergenerational social justice nonprofit that promotes Asian American identity while addressing contemporary issues affecting our communities. The National Queer Asian Pacific Islander Alliance (NQAPIA) is a federation of LGBTQ Asian American, South Asian, Southeast Asian and Pacific Islander organizations. NQAPIA seeks to build the capacity of local LGBT API organizations, invigorate grassroots organizing, develop leadership, and challenge homophobia, racism, and anti-immigrant bias. NQAPIA is an independent non-profit organization. The National Queer Asian Pacific Islander Alliance (NQAPIA) is on the Web atNQAPIA.org. On Facebook at facebook.com/NQAPIA and on Twitter at @NQAPIA.